For fixed, one time or annual events, NCompassTrac has created an industry first cradle to grave Event LifeCycle Management solution. From pre-event marketing, live revenue and demographic tracking, high speed payment and transaction processing as well as post event customer experience management, TracPay has it all. Our industry standard events card boasts high speed capture using QR, barcode or RFID technology to control the entire commerce cycle of any track event such as "track days", NHRA or any concert, state fair, carnival or enthusiast based festival venue. What’s more, for iPhone and Android users, our “Virtual Card” and app can be loaded with event currency in advance or at any event. Any event looking to automate vendor sales and eliminate inefficiencies and theft that are often found at fairs, concerts and other enthusiast events. NcompassTrac works with industry professionals to deliver the best technology that aid and assist with building customer bonds that in turn generate high attendance rates. Cloud based loyalty rewards program in a box. It provides Event Attendees a rewards card that enforces the event brand excellence customers desire. By using digital and social push marketing techniques that not only incent existing brand fan enthusiasts, but will create new ones, that will continually drive new prospect and existing enthusiasts to your venue. 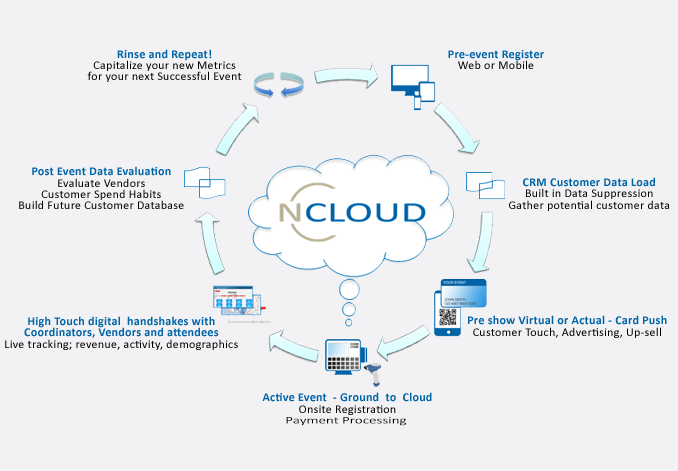 By using custom event cards with incentives and discounts, tied to the NcompassTrac Loyalty Rewards Cloud, you will create an own eco-system and currency within your business that will drive repeat business for years to come. What’s more, when followed up with emails and virtual digital card promotions, you extend the life of the card program making the no expiration card a reality if desired. This eliminates the need and cost in subsequent annual card mailers. By putting a card-based marketing system to work for your event, you are touching existing and future customer loyalists, giving them a reason to continue doing attending year after year. This greatly assists with attendee retention, the recapture of lost venue enthusiasts, and the acquisition of new attendees in your community.